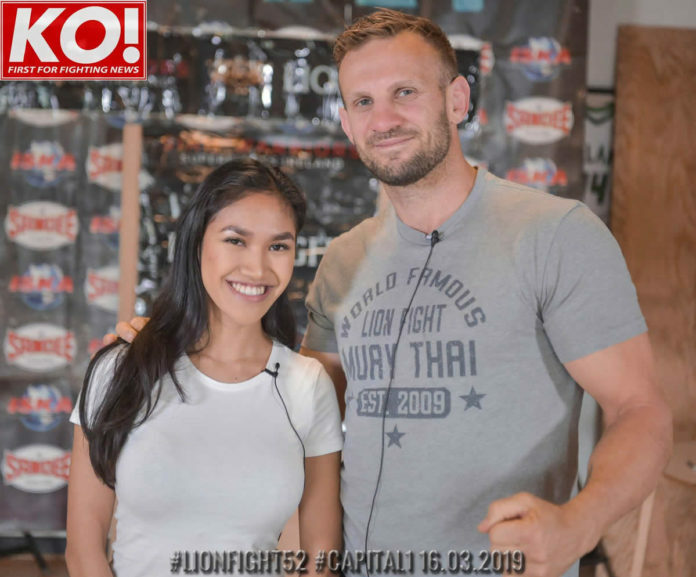 Lion Fight kicked off 2019 with a bang launching the year last month in Los Angeles. We then took the show on the road presenting our second event this past Saturday (Mar. 16) in Dublin, teaming up with Capital 1 Muay Thai promotion. The lineup was stacked with local talent, featuring international stars on the main card. The 16-fight card really gave Ireland’s up and comers a chance to shine and showcase their skills. But like all fight nights, the headline-bouts were what most people were interested in watching live at the packed arena, and of course on CBS Sports throughout America. The semi-main event was local champion Sean Clancy up against Australian Roy Wills, fighting out of the Pit gym in Perth, WA where Toby “The Weapon” Smith trains with the famous trainer Nugget Mcnaught. The fight was a technical battle for five rounds. Wills started the strongest by showcasing his skills and fighting with pure Muay Thai class. But those who know Clancy also known as “The Clubber”, he just weathered the storm and kept pushing forward tying up “The Rebel” and used the knees and elbows well. By Round 2 both men were cut with beautifully timed elbows. Although it was a true battle it didn’t show either man down until the end of the fight, which went all five rounds. The judges’ decision, a very hard match to choose the winner, went in favor of “Clubber” Clancy. This fight could have been a headliner, but we still had the main event coming up next with the Lion Fight Light Heavyweight title on the line featuring Hamza Ngoto from France faceoff Toby Smith from Australia. Hamza, a 6.4ft giant and current MAX Muay Thai champion was not an easy matchup for “The Weapon”. Yet, as we all know, Toby is a wrecking machine that loves a war. Smith started strong pushing Ngoto back, landing heavy hands and kicks. At one moment he threw him over the ropes to be caught by the judges table. But not long after, Ngoto landed a chopping axe elbow on top of Smith’s head cutting him. The fight became a battle with both men delivering some serious hits causing more damage. The doctor was doing a great job to keep both fighters going. Hamza used his range well in the later rounds, making Smith’s job difficult to land clean shots. Frenchman managed to chip away to a victory over five rounds of action. He walked away as a new Lion Fight World Champion. A rematch might be possible in the near future. It was also nice to talk to Vanessa Campos of KO Media and share the story behind the creation of the name “Carnage”, which has been my global brand for almost two decades now. We are now back to the US for Lion Fight 53. The event is held on March 30 at the Downtown Las Vegas Events Center (DLVEC) live on CBS Sports network. I wish Lion Fight 52 from Dublin on March 16th was broadcast on CBS SN, but in fact they did not show it live or tape delayed. Just plain skipped over it, not on the channel at any time.